In 1995, Julie Püttgen began her studies of Vipassana meditation with Steve & Rosemary Weissman, then resident teachers at Wat Khao Tham, a small nunnery on an island in the south of Thailand. Having decided on the basis of that experience to explore monastic life for herself, she lived and trained at Plum Village, Vietnamese Zen Master Thich Nhat Hahn's monastery in the south of France, before joining the Thai-tradition English Forest Sangha as a resident laywoman and novice nun for three years, from 1996-1999. Since then, her Buddhist training has extended into the Soto and Rinzai Zen schools, and into the embodied Tibetan-tradition Mahamudra practices taught by Lama Willa Miller, Lama John Makransky, Reggie Ray, and others. Julie is an artist, expressive arts and somatic psychotherapist, writer, mover, and arts facilitator living and practicing in New Hampshire. As a meditation teacher, she is passionate about the intersections of contemplative and creative practices, and how these can inform one another. 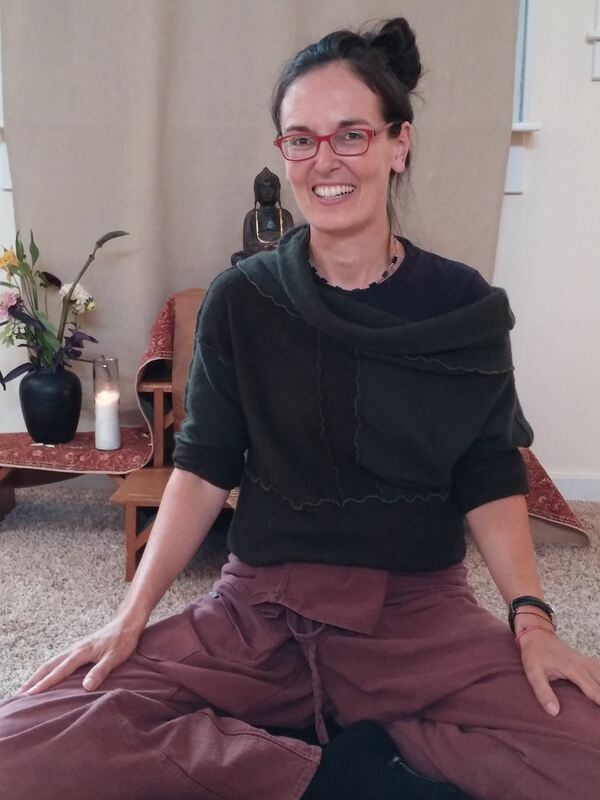 For the past three years, she has been part of a team facilitating retreats and programs in the new Art/Dharma track at the Barre Center for Buddhist Studies in Barre, MA. She is the founder and facilitator of the Old Dragons’ Club, a non-sectarian women’s group in the Buddhist traditions; and Meditations for Resilience and Resistance, a modality she has created to integrate the expressive and contemplative arts. You can see her projects online at www.108namesofnow.com and www.everyday-regalia.com. Location The retreat will be held in Atlanta at Red Clay Sangha. For information and directions, please see our location page. Partial Attendance Friday night and Sunday morning are open to all. Saturday all attendees should plan on full attendance. No Meals A light vegetarian meal will be provided for lunch on Saturday. No Cost There is no cost to attend this retreat. There will be an opportunity to practice Dana (generosity) to the teacher. Questions or More Information? please contact Sally Landrum.